The Rebel Sweetheart. 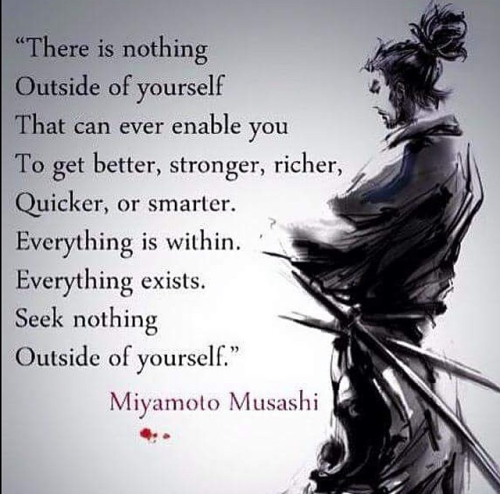 : Wordless Wednesday #131 | Musashi Wisdom. Miyamoto Musashi (1584-1645) - ronin and expert swordsman. What wonderful truth your quote speaks! Thank you for sharing! Have a wonderful week! What a motivating and inspiring quote. This is so true. We are enough! I agree that is a powerful quote! It's pretty powerful the things we can do from the inside out. This is totally true indeed and so inspiring also. We are in charge of our own destiny and we are the ones that know ourselves the best. Thanks for sharing. Such an inspirational and wise quote. So often we go looking for answers when they are right in front of us. This is a great quote! If we use what is already given to us we can achieve all of those things.